Our mission is to provide a place of worship for all those who are traveling, looking for meaning, re-establishing their faith or enriching their spirituality. Our goal is to establish a mature formation of Catholic Christians with a growing concern for the public and environment. We provide a beautiful and peaceful place of worship, a place for respite from your busy life, a place to connect and feel safe. 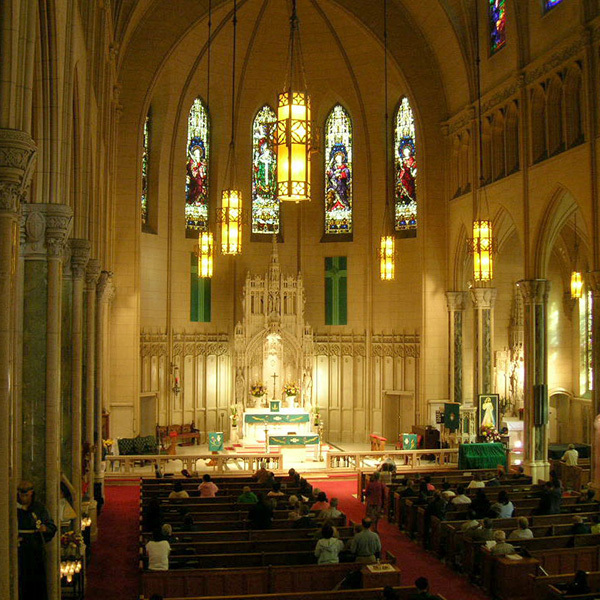 St. Patrick Church is opened daily until 6:15pm on weekdays and 6:45pm on weekends. St. Patrick’s is uniquely a sign of God’s loving presence. It was here when the miners left for the gold country, it served the Irish immigrants, withstood the great fire and earthquake of 1906, continued to serve the Irish, then the Spanish-speaking, now the Filipino community, the numerous tourists and conventioneers and always the business world by which it is surrounded. Unchanged in the midst of change, it still repeats for all the message of Him who is the resurrection and the life. St. Patrick Church’s elegant architecture is accented by the Irish national colors, green Connemara marble, and white and gold Botticino marble. Each of the patron saints of the thirty-two counties of Ireland is proudly showcased on the Tiffany-style stained-glass windows, which also depict the rich heritage and traditions of the Irish. If you are a visitor or have benefited from your time at St. Patrick Church, please consider making an online donation or regular contribution. The church needs your support!